Kick off your visit on the 17th (Wed): get into the urban bustle at Kallithea Springs. 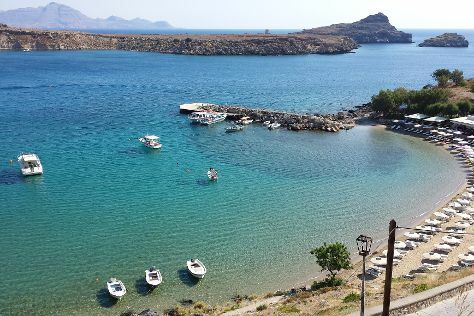 Keep things going the next day: kick back and relax at Lindos Beach and then tour the pleasant surroundings at Tsambika Beach. To see where to stay, maps, other places to visit, and other tourist information, refer to the Rhodes Town trip maker website . Berlin, Germany to Rhodes Town is an approximately 6.5-hour flight. You can also do a combination of car and ferry; or do a combination of train, bus, and ferry. The time zone difference moving from Central European Time (CET) to Eastern European Time (EET) is 1 hour. Expect a daytime high around 35°C in July, and nighttime lows around 28°C. Wrap up your sightseeing on the 19th (Fri) to allow time to travel to Rethymnon. 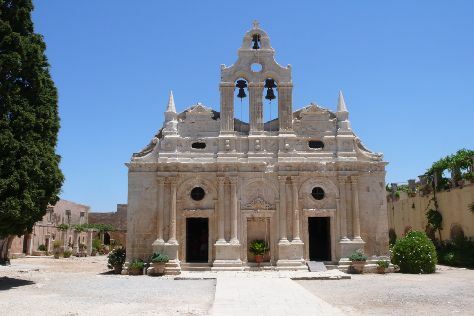 Kick off your visit on the 20th (Sat): contemplate in the serene atmosphere at Monastery of Panagia Chalevi, then contemplate in the serene atmosphere at Monastery of Arkadi, then take in the architecture and atmosphere at St. Nicholas Church, and finally contemplate the long history of The Venetian Fortezza. Keep things going the next day: explore the ancient world of Ancient Aptera, then get engrossed in the history at Historical & Folklore Museum of Gavalochori, then explore the activities along Lake Kournas, and finally pause for some serene contemplation at Four Martyrs Church. For traveler tips, photos, other places to visit, and other tourist information, refer to the Rethymnon itinerary maker . Getting from Rhodes Town to Rethymnon by combination of flight and shuttle takes about 4 hours. Other options: do a combination of ferry and car. In July, daytime highs in Rethymnon are 37°C, while nighttime lows are 25°C. Finish your sightseeing early on the 21st (Sun) so you can ride a ferry to Kamari. Kamari is a coastal village on the southeastern part of the Aegean island of Santorini, Greece, in the Cyclades archipelago with a population of approx. You'll discover tucked-away gems like Wine Museum Koutsogiannopoulos and Santo Winery. Get some historical perspective at Ancient Thera and Akrotiri. When in Kamari, make a side trip to see Akrotiri LightHouse in Akrotiri, approximately 32 minutes away. And it doesn't end there: enjoy the sand and surf at Perivolos, view the masterpieces at Art Space, indulge your senses at some of the top wineries in the area, and pause for some serene contemplation at Cathedral of Saint John the Baptist. To find traveler tips, ratings, photos, and more tourist information, you can read our Kamari travel planning tool . You can ride a ferry from Rethymnon to Kamari in 2.5 hours. Alternatively, you can do a combination of taxi and ferry. In July, plan for daily highs up to 35°C, and evening lows to 27°C. Finish your sightseeing early on the 24th (Wed) to allow enough time to ride a ferry to Naxos. On the 25th (Thu), kick back and relax at Agios Prokopios Beach, explore the ancient world of Temple of Apollo, delve into the distant past at Portara, then contemplate the long history of Old Town, and finally look for gifts at Ta Axotica Gift Shop. On your second day here, view the masterpieces at Fish & Olive, delve into the distant past at Tower of Zevgolis, then examine the collection at Eggares Olive Press Museum, and finally stroll through Plaka Beach. To see photos, where to stay, more things to do, and more tourist information, you can read our Naxos online trip itinerary maker . Traveling by ferry from Kamari to Naxos takes 1.5 hours. In July, daytime highs in Naxos are 34°C, while nighttime lows are 26°C. Finish up your sightseeing early on the 26th (Fri) so you can travel to Athens. 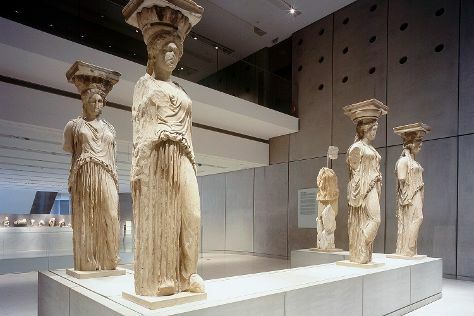 Start off your visit on the 27th (Sat): get engrossed in the history at Acropolis Museum and then delve into the distant past at Acropolis of Athens. Keep things going the next day: pause for some serene contemplation at Church of Kapnikarea, take a stroll through Plaka, and then explore the world behind art at National Archaeological Museum. For where to stay, other places to visit, maps, and more tourist information, you can read our Athens day trip planning tool . Getting from Naxos to Athens by combination of flight and subway takes about 2.5 hours. Other options: ride a ferry; or do a combination of ferry and flight. While traveling from Naxos, expect somewhat warmer days and about the same nights in Athens, ranging from highs of 38°C to lows of 28°C. 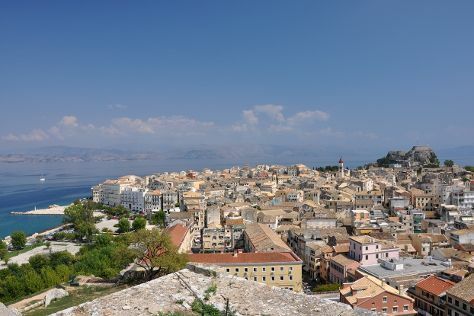 Finish your sightseeing early on the 28th (Sun) to allow enough time to travel to Corfu Town. Deepen your sense of the past at sights like Kassiopi and Paleokastritsa Monastery. Let the collections at Achilleion Museum and Casa Parlante capture your imagination. Explore Corfu Town's surroundings by going to Paralia Agios Georgios (in Agios Georgios) and La Grotta Beach (in Paleokastritsa). There's lots more to do: wander the streets of Corfu Old Town, expand your understanding of the military at Old Fortress Corfu, take in the architecture and atmosphere at Church of Saint Ioannis the Precursor, and take in the exciting artwork at Icon Gallery. To see maps, reviews, and tourist information, use the Corfu Town online driving holiday planner . Traveling by combination of subway and flight from Athens to Corfu Town takes 3 hours. Alternatively, you can do a combination of car and ferry; or take a bus. Plan for slightly colder nights when traveling from Athens in July since evenings lows in Corfu Town dip to 24°C. Cap off your sightseeing on the 31st (Wed) early enough to travel back home.